Matt Wrath is a beefy, burly, UGLY male elf. At 6’2” and 275 lbs, he’s built more like an ork than an elf, and his body shows years of abuse and a body that’s been poorly patched and stitched together. He’s got numerous scars all over his body, and his nose has been broken and improperly reset several times. 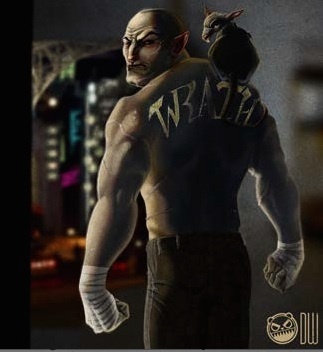 His head and face are both clean shaven, and he has several tattoos, including the name “Wrath” written in glittering gold across his back. He was recently made a member of Jackpoint due to his knowledge of the CZ and other z-zones.